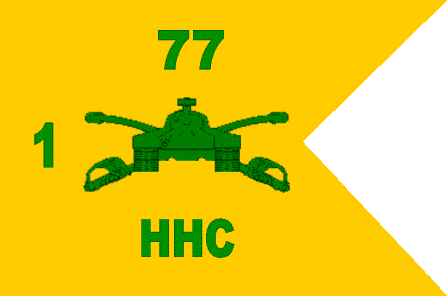 The 1st Battalion, 77th Armored Regiment was born on 25 April 1941 when A company, 73rd Medium Tank Battalion, GHQ Reserve, was constituted in the Regular Army of the United States. It was redesignated as Company A, 753rd Medium Tank Battalion on 8 May 1941, and officially activated on 1 June 1941 at FT Benning, Georgia. The 753rd continued under this designation throughout World War II. During World War II, the 753rd's first assignment was with the 45th Infantry Division's amphibious assault at Sicily. The battalion fought valiantly throughout the Mediterranean Campaign. In all, the 753rd Medium Tank Battalion participated in seven campaigns: Sicily, Naples-Foggia, Rome-Arno, Southern France, Rhineland, Ardennes-Alsace and Central Europe. 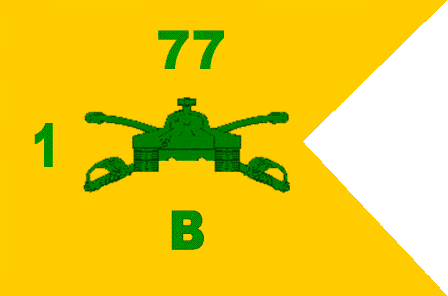 On 20 March 1949 the 753rd was redesignated as Company A, 77th Heavy Tank Battalion as an element of the 7th Infantry Division. During its tour with the 7th Infantry Division in Korea, the unit served in six campaigns, twice receiving the Republic of Korea Presidential Unit Citation. The battalion was later inactivated on 10 November 1951 in Korea and relieved from its assignment to the 7th Infantry Division. 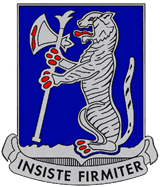 The unit was once again redesignated on 19 February 1962 as Headquarters and Headquarters Company, 1st Battalion, 77th Armor and assigned to the 5th Infantry Division. 1-77 Armor fought in Vietnam with the 1st Brigade, 5th Infantry Division. Consequently, 1-77 Armor was the first unit of the 1st Brigade of the 5th Infantry Division committed to combat in Vietnam. By the time of its redeployment to the United States, the 1st Battalion, 77th Armor had participated in eight campaigns while in Vietnam. The unit was relieved from its assignment to the 5th Infantry Division and reassigned to the 4th Infantry Division at Fort Carson, Colorado on 21 March 1973. 1-77 was later inactivated on 15 December 1989. 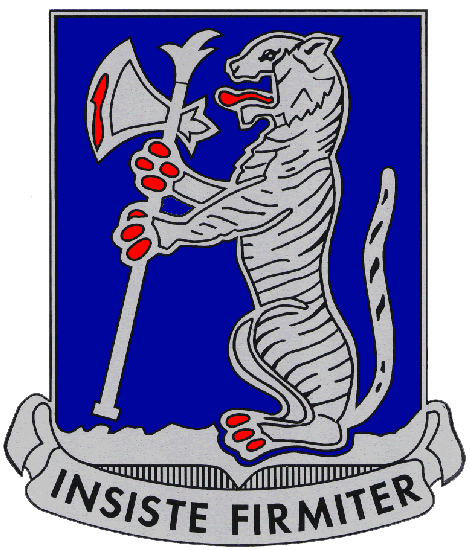 On 05 April 1996, the "Steel Tigers" Battalion was again activated in Schweinfurt, Germany as part of the 2nd "Dagger" Brigade, 1st Infantry Division (Mechanized) located in Conn Barracks. In 1997, Task Force 1-77 joined NATO Peacekeepers in Bosnia as part of Operation Joint Guardian, serving from 7 April to 12 October. Once again in July 1999, the Steel Tigers made history by being the first American Tank Battalion to roll into the Yugoslavia Province of Kosovo in Operation Joint Guardian II, serving in theater from 5 July to 12 December 1999. They successfully served in peacekeeping operations again from May to November 2002 as part of KFOR 4A. The 1-77 Armor Battalion deployed in support of Operation Iraqi Freedom II from February 2004 to February 2005. TF 1-77 was organized as a combined arms task force, with elements from 1-26 IN, 1-18 IN, 1-7 FA, 9 ENG, and 2-108 IN (NYNG), and conducted full-spectrum operations in one of the most highly-contested areas in the Sunni Triangle. Steel Tiger tankers were attached throughout the 2nd Brigade Combat Team and rose to the challenge and defeated insurgents from Bayji to Balad, in the Salah Ad Din province. During Operation Baton Rouge, the Steel Tigers defeated scores of anti-Iraqi forces and helped restore control to the city of Samarra in a 24-hour, 5-day battle. In January 2005, the Steel Tigers once again made history by securing polling sites to allow the Iraqi people the chance to vote in their first democratic election. The 1-77 Armor Battalion deployed in support of Operation Iraqi Freedom 06-08 from August 2006 to November 2007. TF 1-77 was organized as a combined arms task force, with elements from 1-26 IN, 1-18 IN, and 9 ENG and conducted full-spectrum operations in one of the most highly-contested areas in Ramadi in the Al Anbar province. From the ominous days prior to the start of World War II, throughout three long and difficult conflicts and right up through to today's challenging missions in Iraq, the Steel Tigers have exemplified Armor's basic mission: close with and destroy the enemy by the use of mobility, firepower and shock effect. On 17 March 2008, the 1st Battalion, 77th Armor "Steel Tigers", 2nd “Dagger Brigade”, 1st Infantry Division was reflagged to the 3rd Battalion 66th Armor "Black Knights" were activated in Schweinfurt, Germany and assigned to the 172nd "Blackhawk" Infantry Brigade.